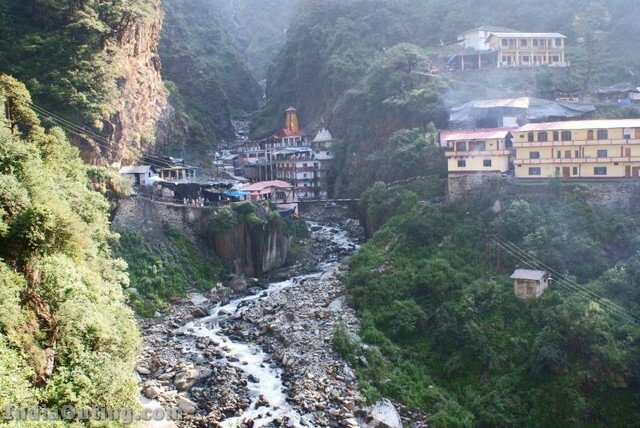 The Yamunotri temple is located in Uttarakhand, India, a full day’s journey from Uttaranchal’s main towns — Rishikesh, Haridwar or Dehradun. The actual temple is only accessible by a thirteen kilometer walk from the town of Hanuman Chatti and a six kilometer walk from Janki Chatti; horses or palanquins are available for rent. 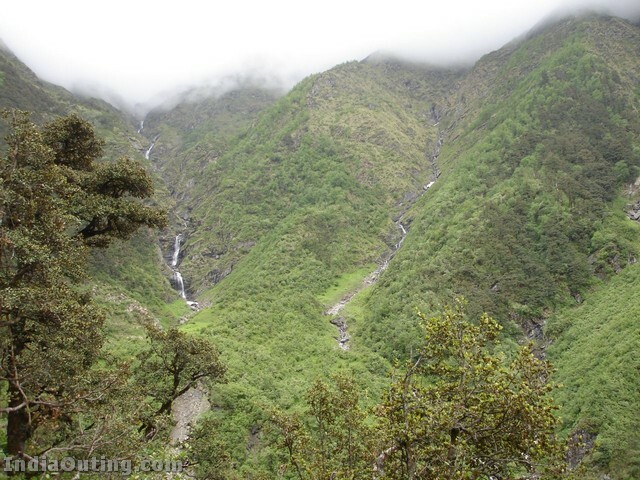 The hike from Hanuman Chatti to Yamunotri is very picturesque with beautiful views of a number of waterfalls. The original temple was built by Maharani Gularia of Jaipur in the 19th century. The current temple is of recent origin as past iterations have been destroyed by the weather and elements. Lodging at the temple itself is limited to a few small ashrams and guest-houses. Ritual duties such as the making and distribution of prasad (sanctified offerings) and the supervision of pujas (ritual venerations) are performed by the Uniyal family of pujaris (priests). 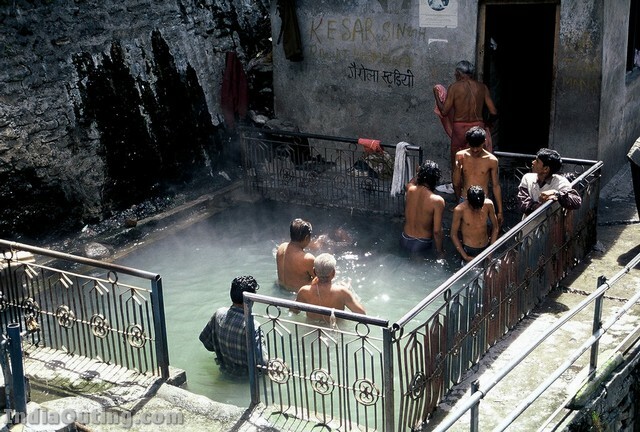 Unique aspects of ritual practice at the site include hot springs where raw rice is cooked and made into prasad. It is located at an altitude of 3,235 metres approximately. 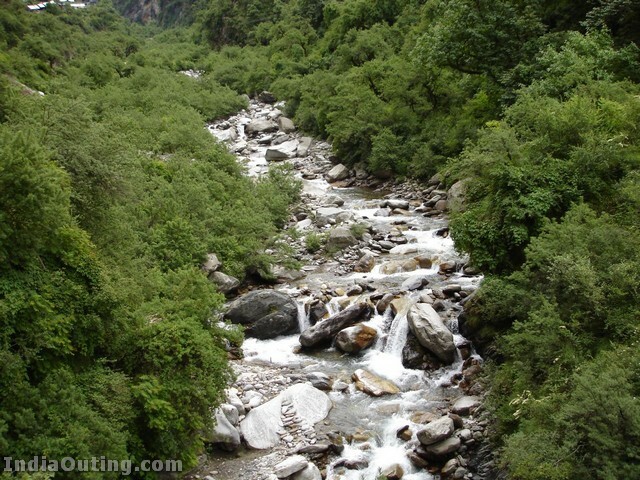 A little ahead is the actual source of the river Yamuna which is at an altitude of about 4,421 metres approximately. Hot springs are also present offering relief to tired hikers. There seems to be a confusion about who built the temple of Yamunotri. 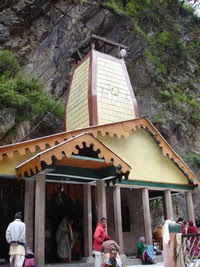 According to the website [uttarkashi.nic.in/Yamunotri.htm], the temple was originally constructed by Maharaj Pratap Shah of Tehri Garhwal. The nearest airport is the Jolly Grant Airport near Dehradun. 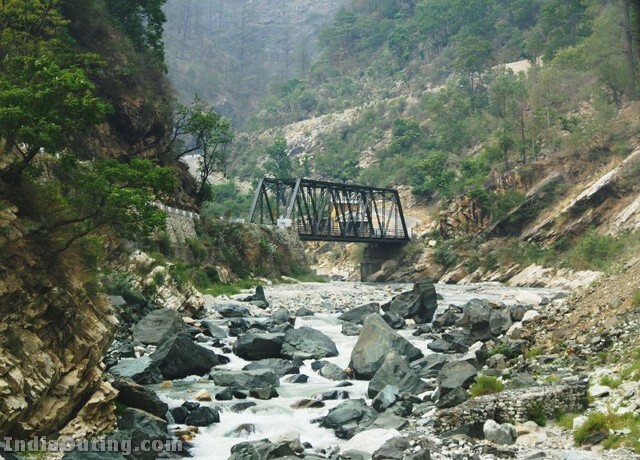 The nearest railway stations to Yamunotri are at Rishikesh and Kotdwa. 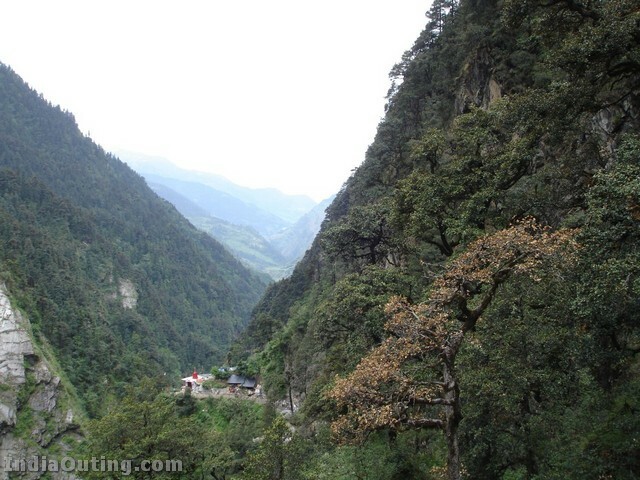 There are regular buses operating to Yamunotri from Delhi, Haridwar and Rishikesh. * Hot Geyser. There is a hot spring near the temple, and many saints live in the surrounding mountains all year round despite the harsh winter at such high elevations. Wool, Ayurvedic medicine, Holy books, sacred threads, sea shells, temple requirements, aarti booklets, colourful beads and braceletes. a romance of nature. feast to eyes and mind. Love at first sight, I aspire to visit at the first opportunity. Thanks for all the information provided. It could have been much useful in case the cost aspect is mentioned for the journey from the nearby towns and the Pony rie Etc. Beautiful Place, Incredible India. 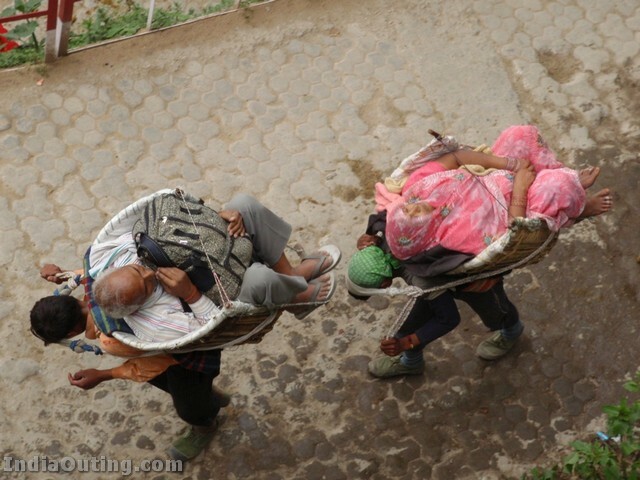 I like these photos but I feel sorry for the people who are carrying other people on their back. Its too hard to climb. one must this place. though only 5 km . to go by horse roding or by foot but u will enjoy though it is very dificukt. very very appreciable scene. Such places are only in India . We must visit these places. This is a really Heaven. I cannot express my views. Foreigners are visiting our country but our people asre spending money for other things but not on seeing historical places. I am proud of you because you are making awareness among people. I must visit this holy beautiful place as early as possible…. Very good. i have been there once. That time the new temple was under construction. Thank you Sneha. Your effort is highly appritiable. It was unfortunate for me, I did not complete this place. I did only Gangotri, Badrinath and Kedarnath with Haridwar, Hrishikesh. PL LET US KNOW ABOUT MANY SUCH PLACES , MAY BE WITH MORE COMMENTARIES. you know my co-worker likes this scene and said me to frwd it. thanks for your all mail. All are great. It feel its very delight to my eyes. very beautifull and nice place for peace. Excellent photographs but need a small caption on each photograph. The best time of the year for a visit and other information on the items and place of stay need mention. Will like to visit the place in 2010 September and feel that sept and october are the best months. Thanks a lot Sneha. Really Nice. This is Heaven for Heavenly minded. If GOD grants I prefer to spend my remaining years here. Yamontri is not a historical place as someone has commented. It is a Holy place and Ma Yamuna starts from here. You must visit when you are young and you can go walking, enjoying the nature and creation of God. If you go during monsoon, the river is bouncing, ceating music, all the way lush green, like you are in the lap of god. Truly, we go to Europ to see beauty & naturre but do not got to Himalyays and enjoy the nature. Gangotri too is alsao a holy place to visit and take a deep in COLD water at Triveni Sangam. I have visited before 5 years. ONLY YOU PRAISE GOD FOR HIS CREATION. Nature is morvelous and GOD is great, there we can see the birth place of YAMUNA river. We are very fortunate to actually see these locations. May be, after another 50 years or so, our future generations have to satisfy themselves with these photos only. The global warming will melt down all the ice caps of Himalayas and we will be left with a great Ganga Desert. 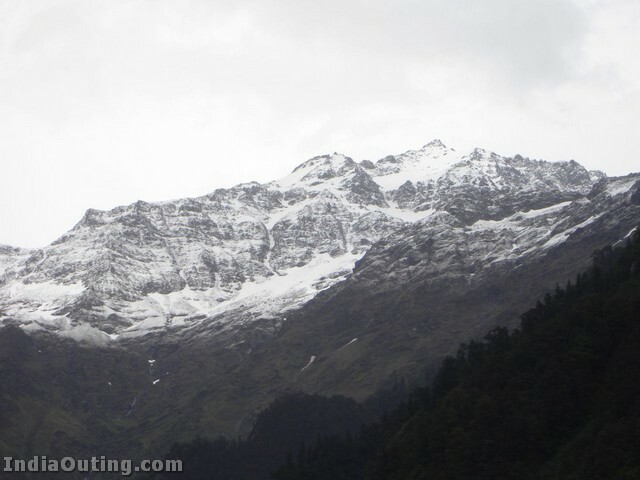 Such is the magnetic attraction of the Himalayan range that every man, woman and child on this planet will be drawn to it if he/she sees these pictures. I am very keen to visit these places. Fantastic. Difficult not impossible to visit despite my age nearing seventy years. Should make it by next year, before it is too late for me. Why not form a team of such persons, we can all begin from chennai and plan a tour as a small group. I want to visit this place once in my life, It is so beutifull,fantastic. Thanks for good photos…………. Hi, I like the Shrek movies, super film! I fantastic place to visit .i want visit here atleast once in my life basically iam a nature lover i love this kind of places really it is a beautiful place….and thaks you for making this kind of photo gallary. Excellent ! 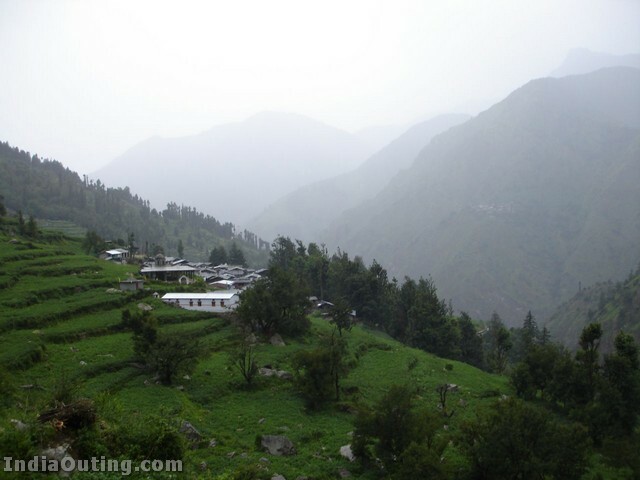 Out Of four dham , ( yamnotri , gangotri , Kedarnath , badrinath ) Highest is yamnotri and also with full of breath taking scenries . thanks, for the beautiful pics. its really really very good. wah kya bat he sach me yaha jannat samayi huyi he. koi nahi keh sakta swarg kha he. this is the real swarg. why we out of go to there. this neutrality.I like very much. beautiful location. 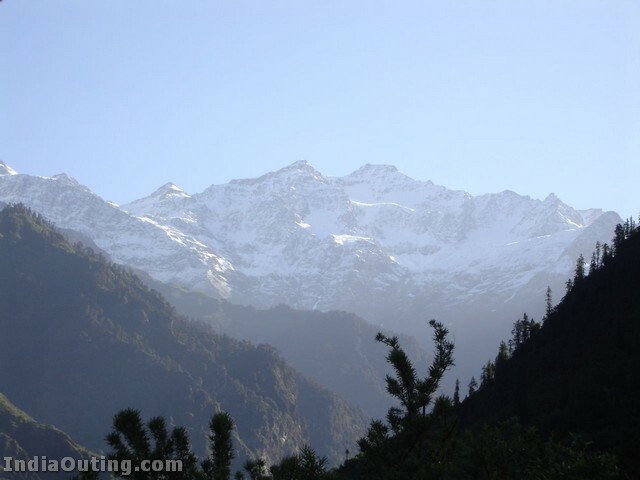 I have visited and enjoyed the beauty of the Nature and The Himalaya Ranges are beauthiful and magnificant. Really beautifull and real pictures, one need not to go physically after glancing at these beautiful photographs. To visit all the places, (Badarinath, Kedarnath, Yamunathri etc.,) God has to call us to make a presence in this place, then only we can go otherwise we have to pray to god to take us to that place to visit. Those who are visited there are really lucky and near to God. Really, that’s glorious and visitable place. I’ll wait 4 this opportunity. WHAT TO SAY ABOUT GOD OWN CREATION RATHER THAN WORDS …… AMAZING OW-SOME MIND BLOWING BEAUTIFUL ETC. I HOPE THIS WORDS ARE ALSO FILL SHY TO EXPRESS THEIR OPINION. Yamunotri is one of pious place out Four Tham Badrinath, Kedarnath,Gangotri.Peacefull pious and from where the River Yayma origin. I must see this place . So beautiful .